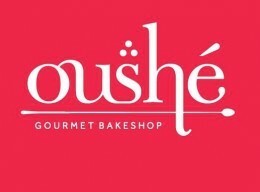 Oushe Gourmet Bakeshop is currently closed for delivery and it will open at . Massaged kale, quinoa, black-eyed peas, red beans, lima beans, mangoes, dried cranberries and a ginger citrusy dressing with all the good fats of coconut oil. Shredded crabsticks, cucumbers, mangoes, mayo and red reddish on a bed of glass noodles, topped with our lime and mayo dressing and toasted peanuts. Edamame, black-eyed peas, quinoa, granny smith apples, cucumbers and tomatoes served on a bed of iceberg lettuce, and topped with our own lime and coriander vinaigrette, parmesan shavings and almond slivers with roasted chicken. Edamame, black-eyed peas, quinoa, granny smith apples, cucumbers and tomatoes served on a bed of iceberg lettuce, and topped with our own lime and coriander vinaigrette, parmesan shavings and almond slivers. Shredded crabsticks, cucumbers, mangoes, and red raddish marinated in our lime and mayo dressing on a bed of iceberg lettuce; served up in a wrap. Roasted turkey, hass avocadoes and tomatoes tossed in homemade Aioli and served on iceberg lettuce on ciabatta bread. Roasted chicken marinated in our own sauce, with celery, spring onions and cashews.